SketchUp's Ruby API (Application Programming Interface) is one of the most powerful things about our software; it's enabled talented programmers to build Ruby scripts (plug-ins and extensions) that allow SketchUp to do some pretty amazing things. This world of add-ons is so big and fast-evolving that we generally don't do a terrific job of providing our blog readers with any insight into it. Here begins an attempt to do better. FredoScale isn't really one tool; it's actually a whole set of tools that you can use to deform your geometry in a number of different ways. Fredo6 makes his plug-ins available as donationware, meaning that they're free to download and use, but that payment is always gladly accepted. Just like most other Ruby scripts, FredoScale works on both Macs and PCs. IMPORTANT: Fredo6 has fixed a couple of issues that were causing problems for some SketchUp users. Take a look at his note for more information. Ever noticed how SketchUp's native Scale tool always lines up it's scaling box with the model axes? That's fine some of the time, but it's not ideal when the thing you're trying to scale isn't perfectly aligned with those axes. See the first image in the figure below: I'd like to stretch the vase along its length. When I select it and choose the Scale tool, its scaling box (made up of 26 green grips) is misaligned because the vase is rotated relative to the axes -- I can't scale it in the direction I want. SketchUp's Scale tool aligns itself with the modeling axes, making it difficult to scale this vase along its vertical axis. Using FredoScale's Scaling tool, I can specify the orientation of the scaling box to make it line up the way I want; all I have to do is click on a face to tell it where to set up. After that, the scaling box works just like SketchUp's Scale tool. Super-handy. FredoScale lets me define the orientation of the scaling box, making it much easier to do what I want to do. The Tapering tool lets you (among other things) turn a sphere into an egg. 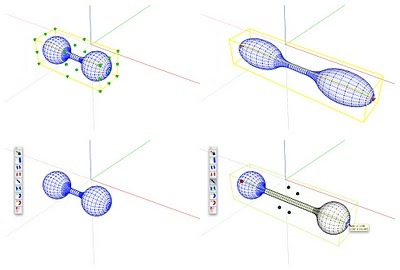 Using SketchUp's native Scale tool stretches the barbell by distorting it (top). FredoScale's Stretching tool somehow figures out what to stretch and what not to, resulting in a smarter stretching operation (bottom). These last two made my jaw drop. FredoScale's Twisting tool lets you corkscrew anything you select; look what it did to an extruded star I modeled (below). The Twisting tool is amazing. Expect a bumper crop of corkscrew buildings in the next 5 years. You can use the Bending tool to do something I've always had a miserable time doing in SketchUp. I wish I'd had it when I modeled Santa. A simple example: Select a cylinder, active the Bending tool, indicate an origin and axis of rotation (bendation?) and go nuts. You need to try it to see how ground-breaking it is. The Bending tool lets you do things you just can't do with regular ol' SketchUp. For more information about Rubies (including how and where to install them), take a look at the Ruby scripts page on the SketchUp website. I am confused, it is April 1st and this is a Google Blog, so where is the April Fool's joke? This appears to be real. It's why I don't like this day because no-one trusts anything. YOu should try "Tools on surface" and "Joint push pull" too. Thanks very much for this kind and nice presentation of the plugin. Be sure that I appreciate, coming from you and Google. Come on Google , Get some of these fab rubies in the core SU app. Fredo sure did a great job, I have a lot of fun using the FredoScale plugin!